While it’s easy to start a blog that shows off your knowledge and insight on a particular topic, making money from it can be a lot harder – those AdSense units probably won’t make as much as you thought. So, why not sell your knowledge itself? The new AskMe widget from Mancx lets you do just that. Once you’ve inserted the widget into your site, visitors can ask a question, give a price that they’re willing to pay for an answer and then send it directly to you. A back-end admin panel acts as a contact management tool and an interface for communicating with the person who asked the question. It also handles billing and payments, and can handle income tax administration in many countries, if you need it to. In return, Mancx takes 20% of revenue from each transaction. 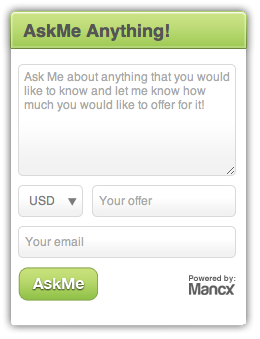 Sweden-based Mancx says that its aim is to “create a thriving global knowledge market by empowering the individual to treat his or her own knowledge as a valuable commodity.” The startup’s not alone in this mission – other services such as MinuteBox are building other ‘knowledge marketplaces’, but Mancx’s AskMe widget could well become an appealing option for bloggers who have built up an audience around their expertise.